PARIS --- The US Defense Department has reached a “handshake agreement” on the next F-35 production batch, Reuters reported from the Farnborough airshow on Sunday evening. The Pentagon’s head of acquisitions, Ellen Lord, said in a statement also issued on Sunday that “The [F-35 Joint Program Office] and Lockheed Martin have made progress and are in the final stages of negotiation on the Lot 11 production contract. The Lot 11 contract has been under negotiation since the previous one, for Lot 10, was awarded in February 2017. Under the peculiar contracting structure adopted for the F-35 program, the Pentagon has in fact already awarded Lot 11 contracts worth a total of $13.06 billion to lockheed Martin, for the aircraft, and to Pratt & Whitney for their engines, which are procured separately. Even only counting contracts worth over $100 million, this already works out to an average of $94.3 million per aircraft, not counting the cost of the ‘handshake deal’ announced on Sunday. -- On May 31, 2018 the Pentagon awarded Pratt & Whitney Military Engines a $2,016,115,217 contract for a total of 135 Lot 11 engines, at an average cost of $14.9 million per engine. a $427,088,637 for the procurement of ancillary military equipment and pilot flight equipment for low rate initial production Lot 11 F-35 Joint Strike Fighter aircraft for the Air Force, Marine Corps, Navy, non-Department of Defense (DoD) participants and foreign military sales (FMS) customers. 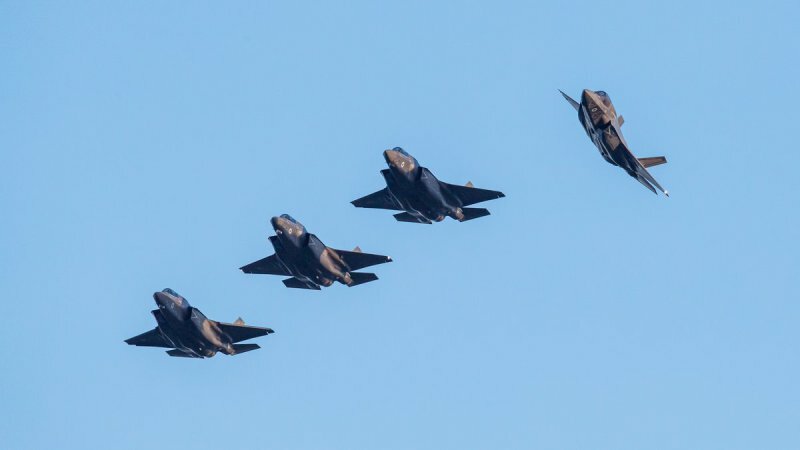 a $3,693,062,124 low-rate initial production Lot 11 F-35 Lightning II advance acquisition contract for the procurement of 50 aircraft for non-Department of Defense participants and foreign military sales (FMS) customers, comprising one F-35B aircraft for the UK; one F-35A aircraft for Italy; eight F-35A aircraft for Australia; eight F-35A aircraft for the Netherlands; four F-35A aircraft for Turkey; six F-35A aircraft for Norway; and 22 F-35A aircraft for FMS customers. -- On June 30, 2017 Pratt & Whitney Military Engines was awarded a $339,645,342 low-rate initial production (LRIP) Lot 11 advance acquisition contract for initial spare engines, initial spare modules, and initial spare parts required to support the LRIP Lot 11 aircraft delivery schedule. -- On March 24, 2016 Lockheed was awarded a $179,916,000 contract for the advance procurement of long lead time materials, parts, components, and effort to maintain the planned production schedule for low-rate initial production (LRIP) Lot 11 F-35 aircraft. The effort also increases the quantity of aircraft that the LRIP 11 AAC supports for the Air Force by 15 F-35A variant aircraft, and for the Marine Corps by 10 F-35B variant aircraft. -- On Dec. 21, 2015 Lockheed was awarded a $1,171,206,489 advance acquisition contract for the advance procurement of long lead time materials, parts, components and effort to maintain the planned production schedule for F-35 low rate initial production Lot 11 aircraft. The advance acquisition effort includes 80 F-35A aircraft (28 for the U.S. Air Force; 6 for the government of Norway; 4 for the government of Turkey; 8 for the government of the Netherlands; 8 for the government of Australia; 10 for the government of Israel; 6 for the government of Japan; and 10 for the government of South Korea); 7 F-35B aircraft (6 for the U.S. Marine Corps; and 1 for the United Kingdom); and 4 F-35C aircraft for the U.S. Navy. * corrected estimated unit price to $94.3 million.